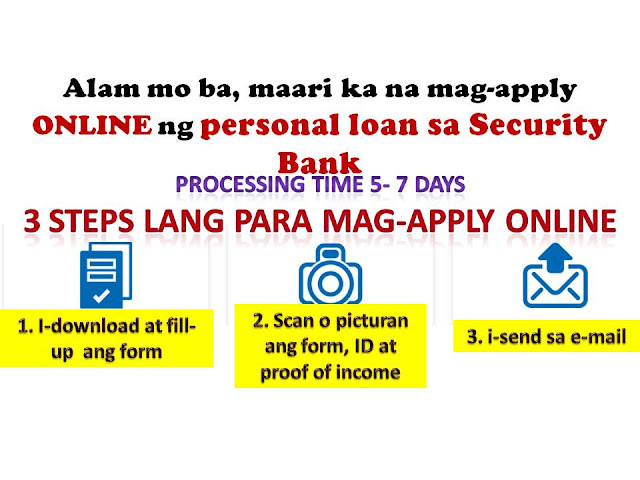 Security bank offers one of the easiest and most convenient ways to apply for a personal loan. Whether for your OFW travel needs, to work or to take your family to a well-deserved vacation abroad, Security Bank offers you their personal loans at a very convenient way. How much can I borrow if I apply for personal loan? How much is the interest rate for personal loan? This bank offers comparatively low interest rate compared to other banks. And if you have more money, we strongly encourage that you pay-off the loan as soon as you could to save on interest expense. How long do I have to pay for my personal loan? The term for personal loan payment is up to 36 months but you can also apply for 12 months, 24, or 18 months depending on you..
How long would it take to process personal loan application? The approval for personal loan usually takes 5-7 banking days. How do I process my personal loan application? Currently, they are offering a very convenient way of applying for personal loan which can be done online. 1. Fill out this form. Or download it from Security Bank's website. Fill it out and sign it. If you prefer, you may also submit your application personally by visiting the nearest Security Bank branch in your area. Where can I follow-up the status of my personal loan application? You may contact their Customer Service Hotline at 02-8879188 or send an email at customerservice@sbcards.com.ph.